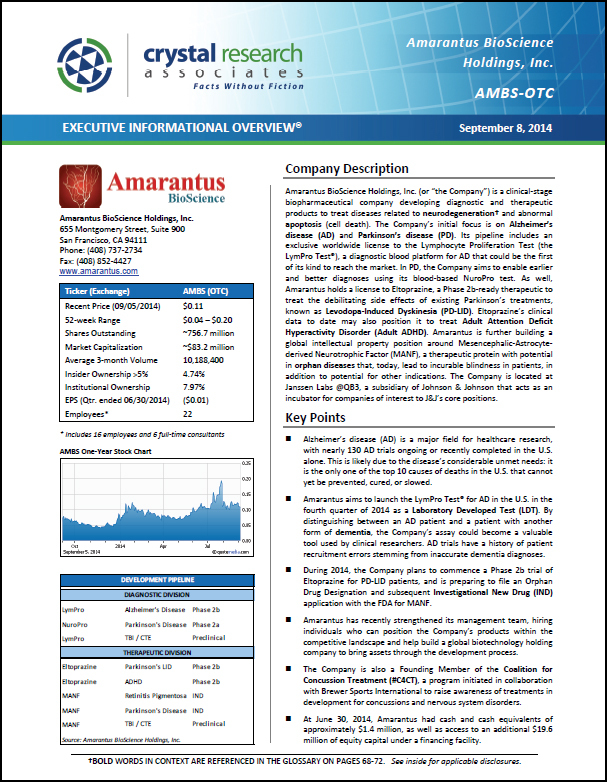 Amarantus BioScience Holdings, Inc. (or “the Company”) is a clinical-stage biopharmaceutical company developing diagnostic and therapeutic products to treat diseases related to neurodegeneration and abnormal apoptosis (cell death). The Company’s initial focus is on Alzheimer’s disease (AD) and Parkinson’s disease (PD). Its pipeline includes an exclusive worldwide license to the Lymphocyte Proliferation Test (the LymPro Test®), a diagnostic blood platform for AD that could be the first of its kind to reach the market. In PD, the Company aims to enable earlier and better diagnoses using its blood-based NuroPro test. As well, Amarantus holds a license to Eltoprazine, a Phase 2b-ready therapeutic to treat the debilitating side effects of existing Parkinson’s treatments, known as Levodopa-Induced Dyskinesia (PD-LID). Eltoprazine’s clinical data to date may also position it to treat Adult Attention Deficit Hyperactivity Disorder (Adult ADHD). Amarantus is further building a global intellectual property position around Mesencephalic-Astrocyte-derived Neurotrophic Factor (MANF), a therapeutic protein with potential in orphan diseases that, today, lead to incurable blindness in patients, in addition to potential for other indications. The Company is located at Janssen Labs @QB3, a subsidiary of Johnson & Johnson that acts as an incubator for companies of interest to J&J’s core positions. * The Corporate Snapshot was last updated on September 8, 2014.